Who are the ‘Blogging Friends’? Until a month ago, we were a group of Stampin’ Up! demonstrators located all across the U.S. and Canada who had never met before. Well, actually, we still haven’t met yet (in person). . . But, through our common bond of Stampin’ Up! and a shared love of papercrafting we have created a fun new blog hop. Please join us on the 1st of every month to see what wonderful things we have created! Each month we’ll have a different theme; this month we’re all about Fall and Hallowe’en! In case you’ve never ‘done’ a blog hop before, it’s really easy! At the bottom of this post, you’ll see another image similar to the one above, and when you click on it, you’ll be taken directly to the next blog in the hop. Keep clicking on that image at the bottom of each blog post, and you’ll hop through all of the participating blogs, back to where you started – and you’ll see all of the amazing projects created for your inspiration! If you’d prefer to hop about at your leisure, you can click on the individual links for each blog; they’ll be the links specifically for this blog hop, so you won’t have to go searching about for what you want to see. Using the Leaflets Framelits Dies, I chose the large Maple leaf and die cut it from the centre of a piece of Real Red cardstock. I then stamped the smaller maple leaf images from the Perpetual Calendar stamp set, using Real Red ink to get the tone-on-tone effect. I wanted to make this a shaker card, so I attached a piece of Window Sheet behind the die-cut maple leaf, then created a raised ‘frame’ around the cut out shape using Stampin’ Dimensionals. I then cut my panel of Crushed Curry cardstock, and piled some gold & silver Sequins, Gold Glitter, and some small apples punched from Real Red cardstock using the Tree Builder Punch. (okay, I know apples don’t come from maple trees, but this is harvest time, right?!) I removed the backing from the Dimensionals, and placed the die cut panel over top of the shaker fillings. Voila! I stamped the sentiment from the Sheltering Tree stamp set in Real Red ink on Whisper White cardstock, and added a strip of Crushed Curry cardstock below it. To finish off the card front, I wrapped some of the new 3/8″ Glitter Ribbon in gold along the left side, then attached the whole front to a card base made of the new Thick Whisper White cardstock. This new thicker white is perfect for those ‘heavier’ card fronts, as well as for making 3D items; it’s very sturdy! I just love the fall colours, as you can tell! Maybe it’s because my birthday is in fall – in fact this year it was on the same day as the first day of Fall! I used the Crushed Curry cardstock for this card base, and attached a panel of Cajun Craze cardstock that I had run through the Big Shot using the retired Stripes embossing folder, and using the 1″ Circle Punch to snip off each corner. I had also sponged the edges with Cajun Craze ink and a Sponge Dauber before attaching it. Next I took a piece of Whisper White cardstock, and stamped the duck image in Archival Black ink. I wanted my duck to be flying over water, so I stamped the image again onto a piece of Window Sheet, then flipped it over and upside down and rubbed over the image onto the cardstock, creating the reflection of the duck. I think this is a Mallard duck, so I checked the colours online, and used my Blender Pens and ink pads in Crumb Cake, Soft Suede, Smoky Slate, Island Indigo, Daffodil Delight and Pumpkin Pie to colour it in. I then used my uni-ball Signo Gel Pen in white to add white highlights to the wings and the ring on the neck. After colouring, I used the Ovals Framelits Collection to die cut the image, and attached it to the embossed panel using Stampin’ Dimensionals. The water and sky were coloured in using an Aqua Painter and Soft Sky ink; the grasses were coloured the same way, using Garden Green and Crumb Cake inks. I used the Vintage Leaves stamp set to stamp the 2 leaves, using my Sponge Daubers to add Cajun Craze, Real Red and Hello Honey inks to the stamps to get the multi-coloured look; then I die cut them with the Big Shot and the Leaflets Framelits Dies. The sentiment was stamped from the Wilderness Awaits set in Crushed Curry onto Whisper White, and it and the Crushed Curry below it were die cut using the Tags & Labels Framelits. I just love having so many Framelits and Dies to choose from, to make my projects easy & professional looking! 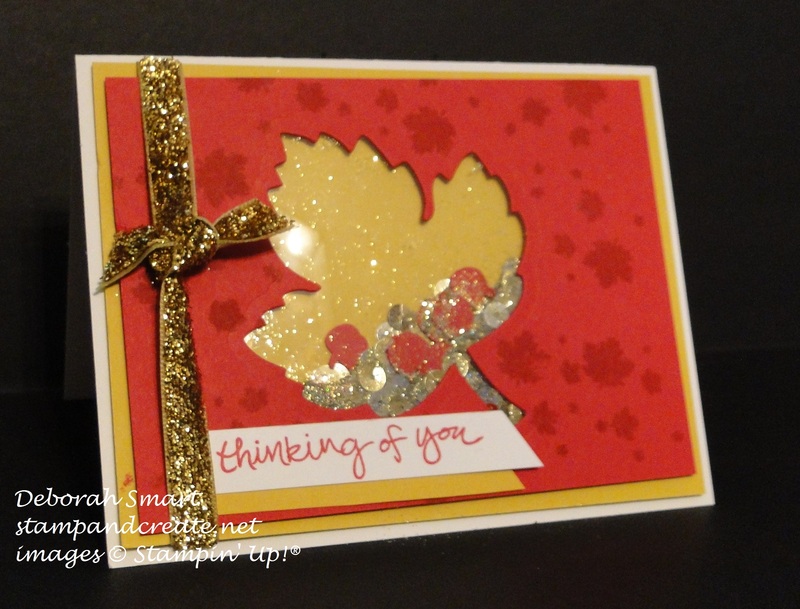 To finish off the card, I attached some loops of Gold Cording Trim behind the leaves and attached them to the card front. How cute is this pumpkin?! And it was so easy to make! I can’t take credit for the witches hat that it’s wearing; that is all for Janet Baker, another Stampin’ Up! demonstrator, whose video I saw and just had to copy! If you want to see it, just click on her name, and it’ll take you to her Youtube video. I started with the Curvy Keepsake Box Thinlits, and die cut 2 of the main pieces from Pumpkin Pie cardstock. Before assembling them, I used the lines image from the Gorgeous Grunge stamp set, and stamped them in Pumpkin Pie ink onto each piece. Since I don’t have the Sparkly Season stamp set, I went ‘old school’ and drew my pumpkin face using the Stampin’ Write Marker in Basic Black. Not too bad! 😉 Next, I assembled the box, using our Tear & Tape, as I’m planning on filling this pumpkin with treats! To create the hat, I used one of the Spider Web Doilies, folded in in half, and cut a small slit down the middle with my Paper Snips. Then, using the Tree Punch, I punched out 2 trees from Basic Black cardstock, and used the 2 1/2″ Circle Punch for the circle, also in Basic Black. Then, using the Word Window Punch, I punched out the center of the 2 1/2″ circle. Using a Glue Dot, I attached the 2 trees together in the centre, then placed a glue dot on the outside of each stem. Then, feed the stems through the opening in the 2 1/2″ circle, and attach the stems to the underside of the circle. There you have your basic witches hat – but to glam it up a bit, use some more glue dots or Tombow multi purpose glue and attach the Spider Web Doily to the base of the hat. Now, the hat can sit over the handle of your pumpkin box, and be taken off when you want to get to the treats! I also added a bow to my witches hat, using the Bow Builder Punch and some retired DSP, and attached it with a Glue Dot. That’s it for my projects – I hope you enjoyed seeing them, and got some ideas for your own creations! If you have the time, I’d love it if you would leave me a message, and let me know how you’re enjoying our inaugural Blogging Friends Blog Hop! Now you can click on the button below, and head over to Jessica Mink’s blog, and see what goodies she has ready for you! Love the shaker card idea! I need to revisit it, mine never work out! Yours looks great! Awesome projects! Oh My Gosh! I just realized you free handed the face! I’m in awe! 🙂 I guess my years of pumpkin carving paid off, Anne! Thanks for your comment! Happy belated Birthday Deb! Love the reflection of the duck…I need to practice that technique. Thanks for your birthday wishes, Chris! I’m glad you liked the duck reflection technique – it’s a fun technique to use! Beautiful cards! 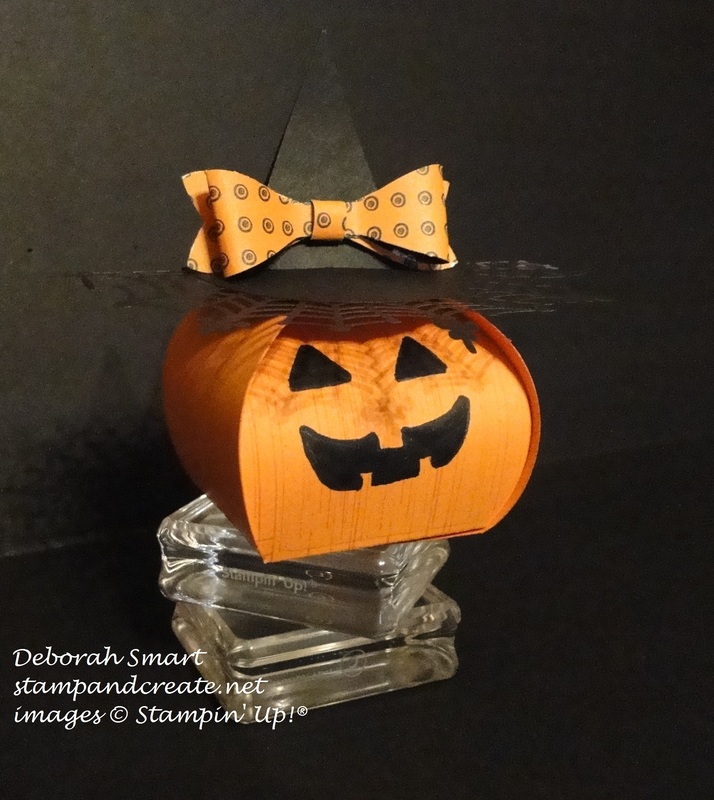 And, I adore the curvy keepsake box Pumpkin! I never would have thought to use Gorgeous Grunge like that and it looks awesome! You make me want to try more 3D projects 🙂 too cute! 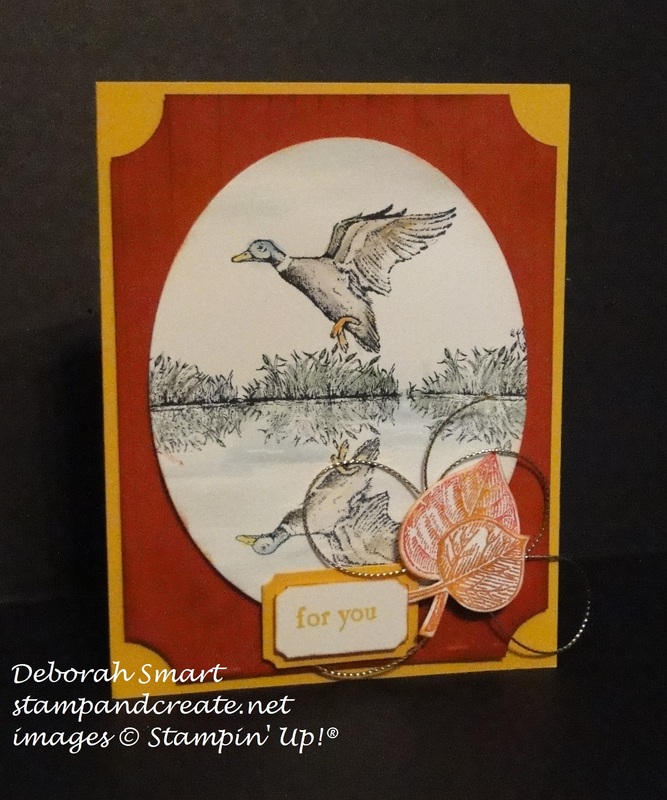 I love your card Deborah! Since you are the only one on the hop from Canada, I agree…the leaf was a perfect choice. I have yet to make a shaker card, but I have everything to try it out. Your’s is beautiful! Love your shaker card….so pretty with all the sparkles from the glitter and ribbon! And what a cute little pumpkin. I still don’t have that die…wishing I had it now since we are full in pumpkin season:) Super cute!! !